Just saw one in my yard in Regina, Saskatchewan. I just saw 3 in my yard, it’s a first for me! St-Joseph du lac (QC) just north of Montreal. …bird in my back yard on December 18th 2012 in the Forbush area of North Carolina what a beautiful bird. Fairly large bird. Yellow tail feather not many maybe just one or two and the red spot on the back of the head area. This is the first time I have ever seen this kind of bird in this area. Found the name of the bird on the internet. Such a beautiful bird…hope to see it again. I often go out on my back deck and feed the squirrels and birds… I noticed lately this beautiful bird and got a photo, granted not the best, but good enough to find it online on your site (thank you, it wasn’t easy to find!) There are several and they are beautiful. I live in Boston and haven’t seen these birds before, I hope they stick around! I found your blog by asking google for red dots on bird heads and I found it! It was the first time I had seen one in my area of wash DC and my son and I were fascinated! I am so glad I can tell him what it is now. I saw another one this morning perhaps the same one or not. I saw a flicker for the first time today. What a pretty bird! Had a hard time finding a picture of it to identify it though. I am not normally a bird watcher, but this one caught my eye when I pulled up the blinds this morning. I live in the woods, in New York state. Guess I’d better start watching! I just remembered….one of my 7th grade papers was on the Flicker. I picked it because I thought the name was neat. I forgot the grade Miss Rice gave me. Mainly I just copied whatever was in the Encyclopedia Brittanica …..Like Mike, I haven’t seen a Flicker in years. 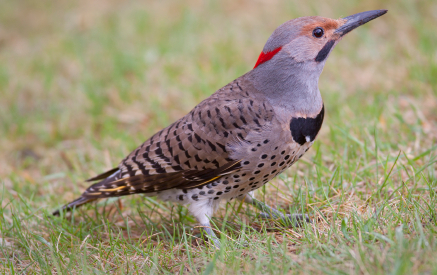 Flickers are pretty common in the city of Seattle! So beautiful for our city eyes! Flickers here in the Central Valley of (N) California abound from late Fall until early Spring; they only leave when it starts getting warm-late March. Their call is so distinctive, it’s imprinted on me since childhood, so I’m always aware when they’re flicking by. Lots of Flickers out here in Pac NW. PS I want that mug!!! Love your blog. Won’t comment on the girls and their markings but the Flicker is still common in central Wisconsin but with their ground foraging seem to be susceptible to the abundance of stray or feral cats. Lots of them still here in Portland, Oregon. I saw a pair yesterday on a rooftop, one of them drumming on a metal vent. They also “ant” on the sidewalks.